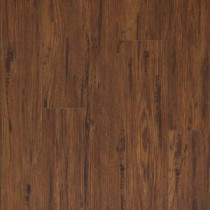 Pergo XP Franklin Lakes Hickory is a warm, red brown hickory with subtle rustic accents. The medium-dark tone coupled with the embossed in register texture produces a flooring with very realistic appeal. This traditional design features narrow planks with a four sided beveled edge. The patented Uniclic joint technology makes installation quick and easy, providing a secure fit. With PermaMax surface protection, Pergo XP offers double the wear and double the durability versus ordinary laminates. The limited lifetime residential and 5-year light commercial warranty, guarantees the top layer against wear through, staining or fading. Made with materials from North America and Europe. Wear claim compared to standard AC3 laminate flooring and measured in accordance with NALFA/ANSI LF-01-2011 and/or EN13329:2006+A1:2008. Buy online Pergo XP Franklin Lakes Hickory Laminate Flooring - 5 in. x 7 in. Take Home Sample PE-879469, leave review and share Your friends.